I wish that it did not take me four visits to Japan to finally make it down to the mystical and heart warming island of Yakushima. While Japan is without doubt the heaven of public transportation with its amazing rail, bus and ferry network, it is personally not as easy for me to move from one place to another in Japan. To me, traveling means – more than anything else – getting a piece of mind through detachment from daily worries and connections; a state of mind which is honestly quite easy to achieve in almost anywhere in Japan. I also believe that there is a connection between constant desire to be on the move/to travel and the feeling of restlessness. So once I land in Japan, my desire to keep moving and changing locations diminishes as I am day by day slowly conquered by the pacifying effect this magnificent country has on me. Being aware of the danger of spending all my time in Kyoto focusing merely on city walks, I pre-commit myself to new destinations by buying train/plane tickets, booking hotels etc. before a trip to Japan so I have to keep moving and get to experience new things. Despite all of this, it still took me too long to visit Yakushima. If I got there earlier, the island would definitely find a room in my every Japan itinerary and join the list of places I – in an almost embarrassing fashion – keep visiting repeatedly such as Lauterbrunnen in Switzerland and Lofoten Islands in Norway. In order to get to Yakushima, I first get on a four hours shinkasen ride departing from Osaka and bound for the southernmost city of mainland Japan – Kagoshima. While you can also fly to the island either directly from Osaka or from Kagoshima, I decide on the the train and the jetfoil (between Kagoshima and Yakushima) combo since I got a Japan rail pass and jetfoil (not covered by the rail pass) is cheaper than a plane with the added benefit of being on the water. The amazing ocean scenery accompanying us during the entire jetfoil ride does not allow me to finish any chapters in my book and within 80 to 90 minutes into our super fast ride, the island makes a shy appearance under a thick layer of clouds. These are very dark clouds that I am talking about – sort of clouds that signify nothing but a heavy rain. While this may normally mean bad news, it is perfectly fine with me as I know that the annual amount of precipitation is what makes this island so green and mystical looking. 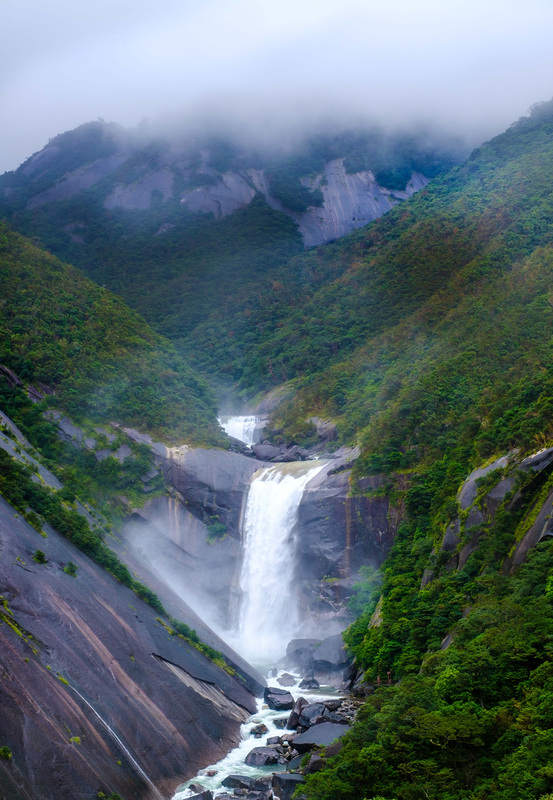 Yakushima is the wettest place in Japan with also a very high Worldwide ranking in terms of the average annual precipitation amount. For me, rain becomes an acceptable and almost a desirable weather event in those cases where it is responsible for the unique beauty of the region I am visiting. Take the example of Scottish Highlands – it sounds a little bit strange when you hear fellow travelers complain about the rain in Scotland when the rain is the only reason behind the amazingly lush landscape that makes the region so beautiful, unique and visitable. Same applies to Yakushima and its moss forests. 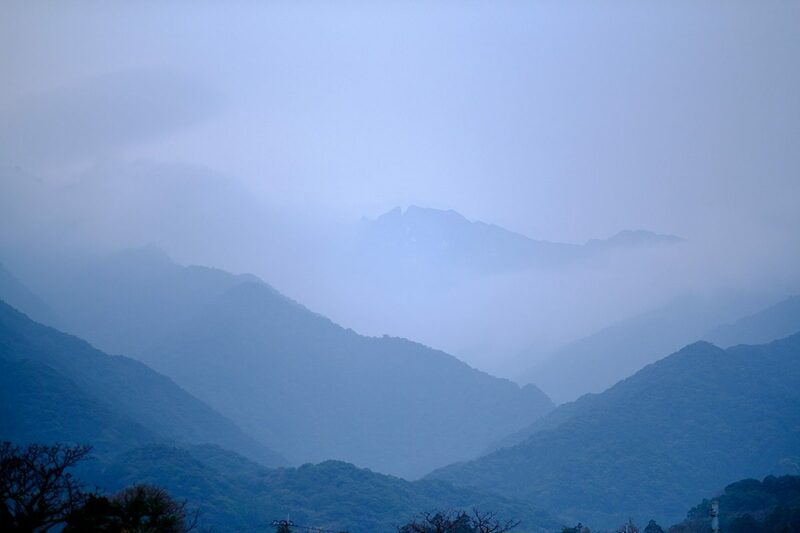 Furthermore, encountering the rain in a nature destination opens the door for amazing scenery, sounds and moments, which are much more engaging than a rainy day in a city. Our jetfoil docks at Miyanoura Port (the biggest town in Yakushima) and I am luckily already trained enough to not get upset about the uninspiring architecture you may encounter in many places in Japan including its remote island towns such as Miyanoura. After four visits to Japan, I learn that those uninspiring buildings and doors open up to much more inspiring interior spaces and people. This disconnection between the nature and the mainstream architectural choices in Japan is very different than another big love of mine Scandinavia where the architecture and choices of design blend in perfectly with the nature and the connection between the the two grow even stronger as you travel further north where the nature gets wilder. This is in my limited experience not the case in Japan no matter how close you get to the nature. I have been to the northernmost island Hokkaido, to the small villages along Kumano Kodo, now Yakushima and also to Japanese Alps, and it is quite rare to come across buildings which feel like a modest extension of the natural scene you are in (unless you are in an area where the traditional architecture is preserved on purpose such as Shirakawa in Gifu or old postal town of Magome located on Nakasendo trail). You will instead in many places likely encounter concrete buildings looking very much detached from the surrounding nature. The architectural scenery in Miyanoura is no exception to this general rule. Alex Kerr, the author of Lost Japan: Last Glimpse at Beautiful Japan, heavily criticizes the construction policies in Japan and the countries growing detachment from the nature over the last few decades. His book is a must read for anyone looking for an alternative perspective to some of the concepts, which normally fascinate us about Japan (take the example of the section where he through a reference to his friend notes that the game parlors (“pachinko”) may be the only authentic venues left in Japan). Planning a trip to Yakushima is very easy thanks to the abundance of the high quality websites focusing on the island and its hiking trails. Even a quick browse through those various sites is sufficient to ensure you that Yakushima is the right choice as the sense of attachment the page owners feel to this mystical island jumps out of almost every page of their websites. There are many hiking tour companies as well as individual guides active on the island and you can either join group tours or customize your own. Subject to the specific weather and trail conditions, you can also obviously hike without a guide if you are experienced enough. I choose the guide option and I now feel very lucky that her schedule permitted and I got to hike and tour around the island with Jennifer Lue of Yakushima Life. Right from her first response to my hiking inquiry, I knew that I was in the right hands. More about that later. I choose Miyanoura as my base in Yakushima mainly because of the frequency of direct jetfoil services between Kagoshima and Miyanoura. The other main alternative to Miyanoura is Anbo, which is less frequently served by the direct ferry but seems to embrace the small fishing village vibe more than Miyanoura. Even though I initially feel a little bit worried about the quality of accommodation available in Yakushima, my worries fade away within seconds once I arrive at Minshuku Iwakawa, which turns out to be a great little gem with immaculately clean rooms, common areas and an extremely reasonable room price (USD 30 a night for a mid size room during low season). You should however make sure that you select the “new building” option when you book as their old building does not look as inviting. My tatami room at Iwakawa and the very modern downstairs kitchen have all the amenities I need to keep myself entertained after my usual waking up time of 4-5 am – a water boiler and good wifi connection to blog and do some legal work. Right after settling into my room, I enjoy an evening walk in Miyanoura followed by a quick but a tasty dinner at a barbecue place called Yakiniku, which feels cozy enough with its all wooden interior. The next morning, Jennifer comes to pick me up from Miyanoura even though she lives down in Anbo, which is around a 25 minutes drive from Miyanoura. The plan for the day is to drive around the island to make a full circle and cover the entire 160 kms, visit an ocean side shrine – Yahazu Daké Jinja, stop for short forest walks to get close to famous monkeys and deers of Yakushima (which as Jennifer points out are somehow all more easy going compared to their fellow species living elsewhere, but you do still need to give a respectful distance), check out a lighthouse on the way, get a soba lunch at a very beautiful village restaurant surrounded by greenery and called Matsutaké and visit some of the many beautiful waterfalls of Yakushima. Jennifer has been living in Japan for nearly fifteen years and is very fluent in Japanese. She has been a Yakushima resident for six years now and works as a licensed hiking guide with her services being available to both English and Japanese speakers. She has an extremely remarkable academical background earned in USA where she is originally from (it probably does not get any better than an academic background involving a physics and electrical engineering degree from MIT) but for me what is even more remarkable about her is her life choices. She is not afraid of saying goodbye to the places where she does not feel inspired in favor of unfamiliar but potentially more inspiring places. While some may consider me as a courageous person for leaving behind a legal career at a relatively young age of 37 in favor of travel writing, photography and to be honest most of the time just for traveling, I still think a lot of my life choices prioritize safety and certainty over everything else. I want to live in Japan or New Zealand for a certain period of time but I cannot talk myself into taking the leap unless I first find a job or a steady source of revenue. However, that is usually not how it works for people who are courageous enough to take the leap for a more fulfilling life. They are not as afraid of leaving behind uninspiring environments for a better place even if the initial conditions are not necessarily perfect. Jennifer is the first of many people I meet in Japan during this trip who are, while definitely having put in the necessary work for a remarkable academic background and a professional career, not afraid of change both in terms of location and the line of work they engage in to surround themselves with more inspiring things and people. As we drive around the island, I quickly reach a mental state which is very common for me if I am thrilled about a place. At every single stop we make, I am absolutely sure that we are now at my favorite place on the island. The amazement starts right away with a visit to the ocean side shrine and continues with numerous waterfalls we visit during the day. So Ohko Waterfall is my ultimate favorite in Yakushima until I see Senpiro Waterfall, which loses its title as soon as I lay my eyes on Toroki Waterfall. Looking back at the day now, I think the ocean side shrine was my true favorite along with Tokori Waterfall, which is the only waterfall joining the ocean in Japan. The ocean side shrine and the surrounding scenery remind me of the scenes from the latest Scorsese movie “Silence” telling the story of Jesuits in Japan (which is to my surprise filmed in Taiwan and not in Japan). Jennifer`s in-depth knowledge about the island, which she kindly shares through the day makes me feel emotionally more connected to the island. Her story about the people of Nagata (a small village in Yakushima) who revolted against the forestry policies of the Japanese Government and won a legal battle against the Government’s destructive logging policies strikes me not only because it involves a legal fight but it is also among one of the rare happy ending stories in its category. I try hard to stop myself from getting very geeky about it and ask her all the boring details about the legal aspects of the ordeal, which are probably only entertaining for lawyers who have worked in that specific field including myself (don`t ask for which side though). Speaking of governmental policies, I also find it very easy to talk with Jennifer about US politics. She makes it much easier to share my sincere thoughts on Trump era USA and some of the potential sociological reasons behind the mass shootings in her country along with the gun legislation. This is very different than the experience I had during my recent Fall 2017 visit to USA where I felt like I needed to say at least two very nice and flattering things about USA to balance out every criticism I raised in order to avoid unpleasant tension. This was my experience not only in my discussions with the republicans but also with many of the democrats. It is however a lot easier to talk with Jennifer about politics, religion and many other cultural issues concerning Japan, US or my own country as our discussion progresses based on the mutual understanding that no country is perfect or “great”. At the end of an amazing day, Jennifer drops me off at my accommodation and it is almost dinner time. I this time decide to check out the trendier Panaroma Restaurant which is pointed out by Jennifer as a pretty good place to have a relaxed meal and some wine. She turns out to be right. Panaroma has some Scandinavian vibe with its very simplistic design. The staff working at the restaurant is also very friendly. I enjoy a couple glasses of wine and a rare chicken, which is quite delicious but a little too small to call it a proper dinner (so do not turn down the rice offered along the rare chicken unless you want to leave the restaurant still feeling hungry). The walk back to Iwakawa takes much longer than I originally I anticipate just like every other evening walk that I take in Japan. The street lighting coupled with the colorful lanterns hanging in front of restaurants make it very difficult to not stop for photos or just to enjoy the dim but colorful street lighting. I also find myself watching the traffic lights, which keep following their regular routine in vain on an entirely empty street where there are no cars to stop or no people to ensure the safe passage of. These are some of the strange visual pleasures that I enjoy in life, which require an environment where you as a women do not feel nervous to wonder around alone at night. Japan`s status as one of the safest countries in the World surely helps with my endeavor. One of my favorite essayists Craig Mod who has been living in Japan for a quite long time makes the following remarks about night walks in Japan in this captivating essay titled “Need to Walk” – “yet the ability to safely walk alone, especially at night, is, for most cities, largely a luxury available only to men (and even then, there are always parts to be avoided). Which is why Tokyo night walks are especially alluring and evocative, seemingly a societal miracle — a city nearly devoid of violent crime, almost no back alley or poorly lit path is off limits. It’s one of the few, true, metropolitan spaces where the right to a safe walk is a nearly universal, indiscriminate, day or night, red light or financial district alike”. Craig Mod talks about Tokyo in his essay – a mega city with a population nearing 15 million people. So you can imagine how the night walks feel even safer in much smaller towns of Japan. I sometimes think that I keep traveling all the way to Japan just to safely walk. 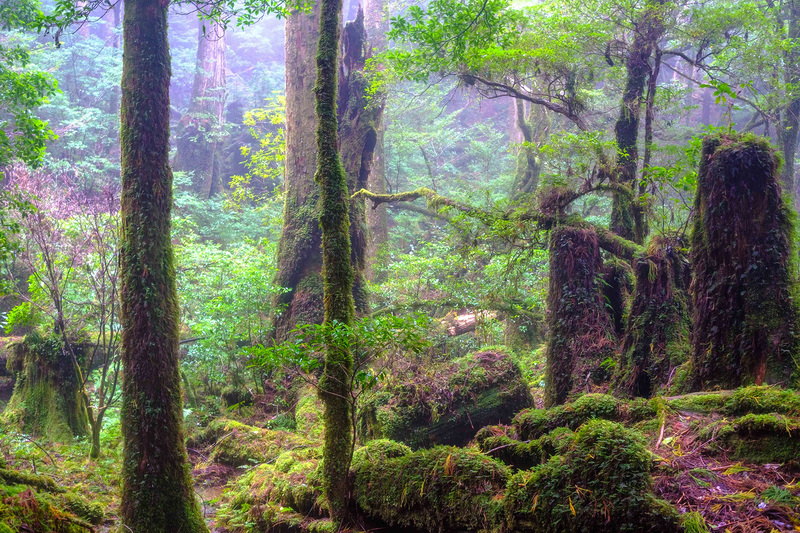 The second full day on the island is entirely devoted to Shiratani – the most famous trail in Yakushima as being home to the moss forest, which is said to have inspired Miyazaki for Princesse Mononoke. Even though the nice Scandinavian couple whom I met the night before at Panaroma Restaurant and had a nice chat with did not sound too thrilled about the hike making me keep my expectations low, Shiratani turns out to be a great hike with a moderate level of difficulty, offering a great scenery and addictive river sounds (I wish there was a musical compilation on iTunes such as “Sounds of Yakushima”. You can however still check out the album “Where We Need No Map” by Andi Otto including a composition titled “Ode to Yakushima”). The trail at Shiratani also rewards us the hikers with an amazing view point at the end of the hike. I don`t think I had fully realized the grandness of Yakushima landscape until I had the benefit of looking at it from Taiko Iwa. Today, we do not run into any of our animal friends that we were surrounded by during our forest walks of yesterday. Jennifer notes that while Shiratani used to be a great spot to hang out with the island deers, the deers deserted the area about three years ago for reasons still unknown and they are yet to be back. While we encounter many hikers along the route on our hike to Taiko Iwa in the morning, Jennifer takes me through a different trail on our way back which is much less crowded. In my experience, it is very rare for a hiking guide to keep that perfect balance between feeding you with information about the area but also understanding that you are also there just to enjoy the scenery and the walk. Jennifer is such a natural in keeping that balance perfectly. So there are many periods during which we walk in silence enjoying the sounds and scenery of Shiratani just to later get engaged in a quite captivating discussion either about the area or World in general when we both feel like it. I am on my own on my last day on the island. Now that Jennifer is gone, I need to rely on public transportation, which is available but quite limited especially during the low season (link to the bus schedule in Yakushima). Yakusugiland – named after the general idea of a theme park, feels fortunately much more special and secluded than the places that it was named after. There are many different trail options available in Yakusugiland where you can take very short walks of 30 minutes or a full tour which takes around 2.5 hours (there is also a detour that you can take for a summit climb as explained on Yakushima Life). I take the 2.5 hours trail, which takes me through number of beautiful suspension bridges. I am almost entirely alone on the track today until I run into a very nice Japanese family at the far end of the track who look at me as their savior. They want to have their family photo taken but they forgot to bring their tripod. Once the photo session is over, we say goodbyes and I am once again all alone on the trail. I take my time sitting by the river and thinking that I should definitely come back to Yakushima for a longer visit next time (and you know I did and that time needs its own post as it was much more than just a travele experience). I really enjoyed the peaceful atmosphere in this traditional place located on the Western side of the island right by Kurio River. You can also use the public bus to get there (2) Panorama Restaurant in Miyanoura (@panorama_yakushima ) is – with its Scandivian vibe and shared tables – a great place to have some wine – they also serve the sashimi version of the famous flying fish of Yakushima and their rare chicken dish is also good. (3) Yakinuku in Miyanoura is a fun barbecue place where you cook your own food. It has a quite cozy interior with its all wooden decoration. (3) Cottage Davis, last but not the least. This gourmet restaurant located in the Sourthern part of the island (very scenic location) is run by a British-Japanese couple and they offer amazing lunch menu with a set price of 1200 Yen from Thursday to Sunday. They also offer dinner on those days except for Sunday and I heard that they have a great wine selection. As for accommodation, I highly recommend the new building of Guesthouse Iwakawa – modern/clean/cheap. I paid USD 30 a night in February for a decent size private room with shared but immaculately clean bathrooms & kitchen area. You can also get some nominal discount if you are staying for more than two weeks. One downside of Miyanoura is that there are not many daytime cafes to hang out or work at and this may be an issue if you are planning an extended trip during which you would not go hiking everyday and have no car. Getting a breakfast outside of your accommodation can also be a little challenging but there is a big grocery store, which opens at 9 am (you will probably leave much earlier than that though for the hikes so it is best get your food for breakfast/hiking the night before). One other place in Yakushima that I cannot recommend enough is South Village Hostel located well in the Southern part of the island. This is a more secluded place and it requires a car if you have only few days on the island as the limited schedule of public buses make life quite hard. The hostel is also close to two ocean side onsens as well as to Onoida Onsen (frequented by locals) and those make a good before dinner walk if you have not already hiked enough during the day. So yes, I also opted for a guided hike in Yakushima at least for part of my trip and that turned out to be a great choice. There is for sure the cost aspect (which is always an issue for me as well) but I highly recommend cutting down some other expenses to have the benefit of a guide at least for a day in Yakushima (have the guide for your first hike, it will help to enrich the quality of your solo hikes on the next days) to get emotionally more connected to the island by hearing all those anecdotes you could not so easily discover on your own (especially if you don`t speak Japanese just like me), to just focus on the hike and not the logistics, to have a better understanding of the nature you are surrounded by and in my case to also benefit from the perspective of a person who is with more than 15 years in Japan a true local but at the same time still able to present the foreigners perspective (@yakushimalife) P.S. When you hire a guide, transportation, lunch and rain gear costs are in most cases included in the price. The official site of Yakushima is also very helpful particularly for the bus schedule. The schedule changes periodically and some outdated ones can also be found around so please be careful. The last thing you want to do in Yakushima is to miss your very rare bus.